There are a number of factors that can upset your body’s delicate digestive balance. Being too busy to eat properly—because of work‚ or even due to traveling on vacation—can put stress on your gastrointestinal system; this can lead to indigestion‚ bloating‚ cramping‚ and diarrhea. If you have irritable bowel syndrome (IBS)‚ Crohn’s disease‚ or another condition that affects the GI tract‚ you may also experience frequent discomfort. 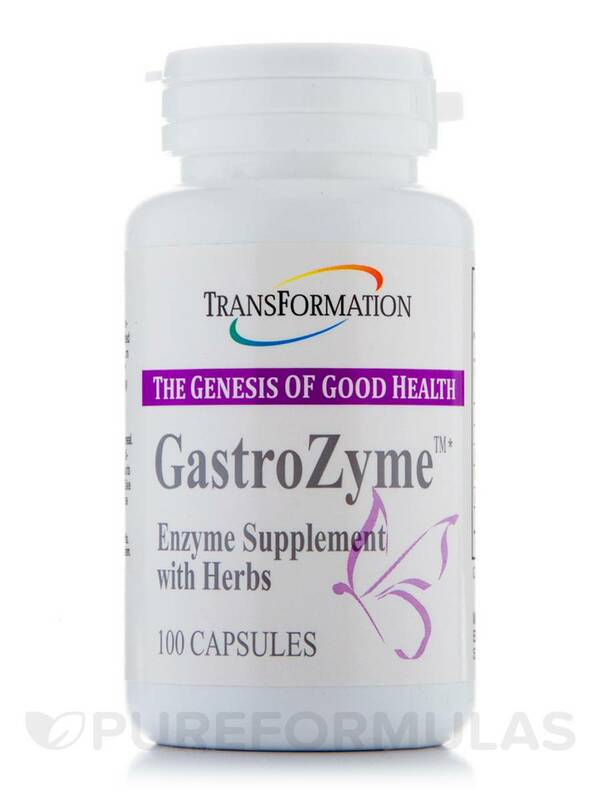 Transformation Enzyme Corporation’s GastroZyme has a powerful combination of enzymes that can help ease your discomfort and get your digestive tract moving normally again. 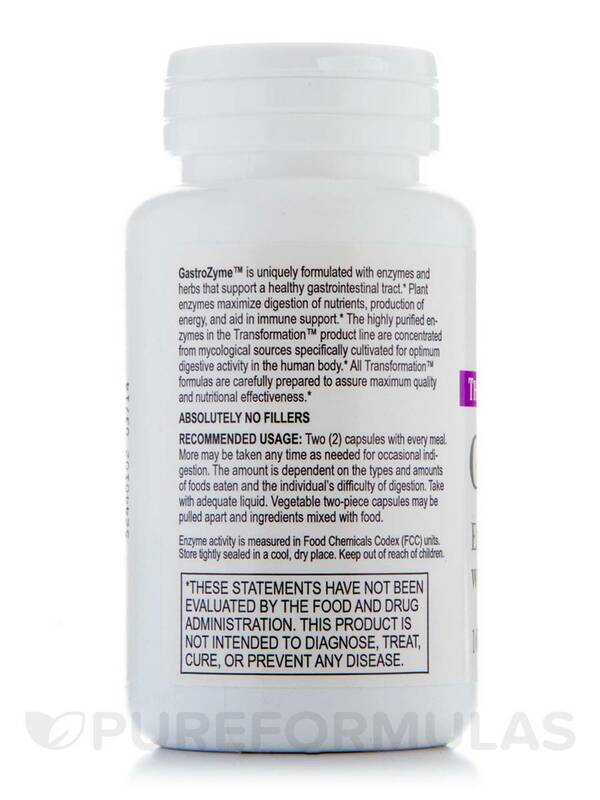 GastroZyme contains both lipase and amylase enzymes‚ both of which aid digestion. Lipase is an enzyme that helps your body break down the fats that you eat; it been shown to reduce gas and the feeling of fullness after a high-fat meal. The amylase enzyme has similar properties‚ except that it works on starches instead of fats‚ making them easier for your body to digest. This supplement also contains a number of other natural plant extracts‚ such as papaya leaf and marshmallow root. Since the 19th century‚ papaya leaf has been used as a potent remedy for problems like nausea and flatulence. Papaya leaf also contains proteins that keep intestinal worms from attaching to the walls of your digestive tract. Meanwhile‚ marshmallow root can help resolve indigestion and digestive inflammation. To help round out the formula‚ GastroZyme also contains Prickly Ash bark‚ which has long been used in Chinese medicine to help with digestion and abdominal pain relief. As with all Transformation Enzyme Corporation products‚ GastroZyme contains only the purest enzymes that have been carefully formulated to provide you with optimal results. 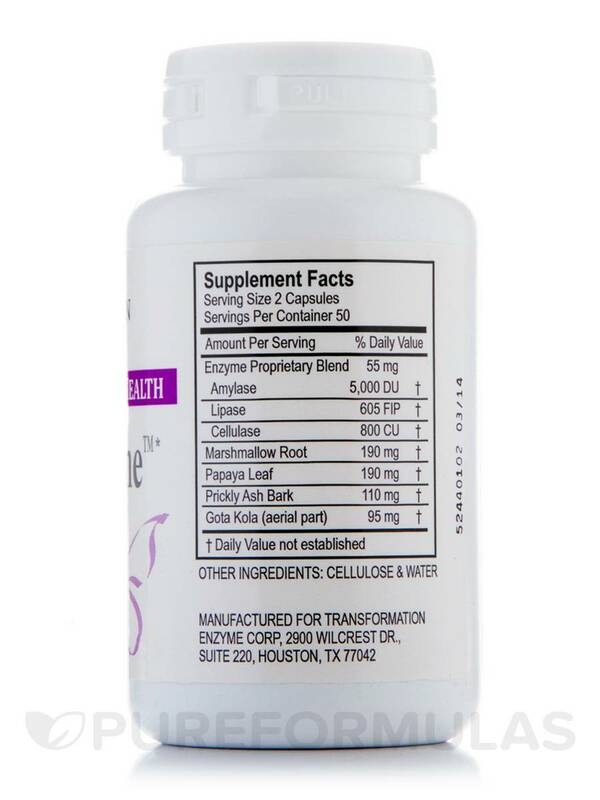 One bottle of GastroZyme by Transformation Enzyme Corporation contains 100 capsules. You should take two capsules with each meal‚ unless otherwise directed by your doctor. Take two (2) capsules with every meal or as directed by healthcare practitioner. I have taken digestive enzymes for many years. After a while, the body sort of 'takes them for granted.' When I changed to GastroZyme by Transformation Enzymes, I experienced the same level of digestion, and it was as if my body said, 'thanks for the change.' I now rotate between the two products. Easy to use. Offers good digestion support. There is a slight herbal taste to the capsules but nothing to detract from their efficacy. I have IBS and a serious gluten and dairy sensitivity. Even being careful of what I ate I would still blow up after my meals and would have a terrible stomach ache. GastroZyme by Transformation Enzymes were recommended by my naturopathic doctor and they are a godsend. I take one 15/20 min before each meal and the fullness feeling and bloating after my meals is gone. These aren't miracle pills. I still have to watch what I eat, but my stomach can handle foods so much better now. The description is 100% accurate. No side effects. Reasonably priced and it works. There is nothing to dislike...this pills works! Recommended by my naturopath for pain relief from and healing for a duodenal ulcer. Used 3 before and 3 after meals - felt relief immediately! It was recommended by my Dr. to use GastroZyme by Transformation along with Gastrex by Standard Process (2 before meals/2 after meals); Chlorophyll Complex by Standard Process (1-2 during meals); and Okra Pepsin E3 by Standard Process (1 after meals - 2x day). This combo worked like a charm, and my ulcer was fully healed in under three months. I cannot recommend Gastrozyme enough to manage the pain associated with this very painful ulcer, and for its obvious benefits in healing the lining of the stomach. Immediately relieves stomach pain from a duodenal ulcer and helps to heal it.